Produced and recorded by Hayden in his home studio, the inspiration to release the new album ‘Cut Love Pt 1’ initially came about when Hayden was contacted by UK based, award winning, contemporary dancer/choreographer, Lukas McFarlane, who was in search of new musical material to choreograph and perform to. The result is an expedition through Hayden’s free-flowing creativity, which takes listeners on an unexpected musical journey through his internal musings on falling out of and into love, relationships and everything in between. Created from musical understanding worthy of Justin Vernon, the record delivers a sequence of captivating, emotional and honest tracks, forming an insight into the mindset of Hayden’s sonic world. ‘Cut Love’, mixed by Tim Carr (Matt Corby), instantly creates an emotionally powerful and heartbreaking impact with its captivating vocals and slow-moving piano chords. It is experimental to say the least, but an experiment that certainly works. It’s exhilarating, truthful and vicariously touching. Ideal for putting on and leaving the world behind. 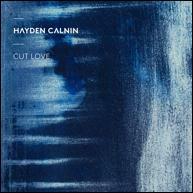 The new single is taken from Hayden’s upcoming album “Cut Love Pt.1” and is available to buy and download from the Friday 12th February 2016. Stay tuned for “Cut Love Pt 1 & 2” in Spring 2016.